otherwise stated and we do thank Michael for allowing the Club to use them. The Finnish Lapphund (Suomenlapinkoira) is believed to be the original native breed used by the Sami people to hunt reindeer in the region known as Lapland. The first breed standard was accepted by the Finnish Kennel Club in 1945 with the breed known as the Lapponian Shepherd Dog. At this time, there were two coat types — a short and long coated dog. By 1967, the long coated dog was given a separate standard and officially named the Finnish Lapphund or Suomenlapinkoira and the short-haired breed was named the Lapponian Herder or Lapinporokoira. Today, in Finland, the breed is among the 15 most popular breeds with a steady increase in popularity throughout the 1990s. The Finnish Lapphund is intelligent, independent, affectionate, adaptable and always willing to work. He has natural herding instincts and makes an excellent watchdog. A fast learner and easily trained, the Lapphund enjoys having a job to do and does very well in many dog sports. The Norwegian Buhund, also known as the Norsk Buhund and Norwegian Sheepdog, is a member of the Spitz family known in Scandinavia even before the days of the Vikings. The Buhund is a herding dog as well as a guardian of livestock and home. 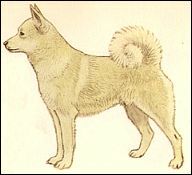 Like most Spitz breeds, the dog is squarely built with erect ears and a tail that curls over the back. The Buhund is a friendly, courageous and energetic dog that gets along well with people and other dogs. Easily trained, agile and alert. In addition to herding, the Buhund is also seen working as a hearing dog and police dog. Also enjoys such activities as agility and obedience. Has a black or wheaten coloured coat which is relatively short but harsh with a soft undercoat. The Lapphunds are mainly known as the reindeer-herder but they were originally used as hunting dogs. The rearing of reindeer in a businesslike manner is relatively new. Most probably it was the Sami tribes that long ago brought the dogs with them to the Northern parts of Scandinavia. 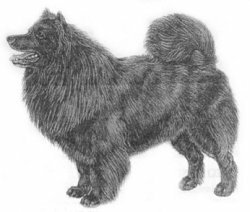 The authentic Lapphund was facing extinction in the beginning of the 20th century. The number of true to type Lapphund’s diminished and the breed could be said to have been saved thanks to an honourable lady down in the County of Småland. She searched for survivors of the true Lapphund and developed the breed at her estate Thorne during the 1940’s and onwards. Ideal height at withers for males is 48 cm; ideal for females is 43 cm. A variation of 3 cm above or under ideal height is acceptable. The coat is profuse, standing out from the body and always black in colour.The coat is profuse, standing out from the body and always black in colour. Nuances of rusty or a sunburned brownish colour is as typical as old undercoat that is almost bear brown when moulting. 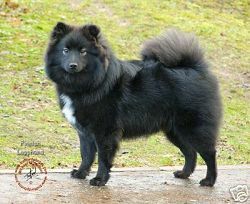 The Swedish Lapphund, like so many other spitz breeds is watchdogs as well as devoted to their family. It is robust, very hardy whether working in the mountains or up in the snowy fjells. It is easily trained and always eager to work. The Lapphund is still used as a reindeer herder but modern equipment like snow-scooters has reduced the need for dogs. The breed is nowadays mainly kept as a companion dog. 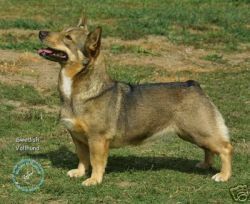 The Swedish Vallhund, also known as the Västgötaspets, Vikingarnas Hund or Viking Dog, is native to Sweden and dates back more than 1000 years to the days of the Vikings. The breed has long been used in Sweden for their cattle-herding ability, strength and stamina. Bred to work as a cattle and sheep herder, herding low to the ground by rounding up and nipping at the hocks, also an accomplished ratter and watchdog. Intelligent, alert, energetic, self-confident, courageous, loyal, and makes an excellent family companion. The SV is easily trained as they are eager to please. The breed is known to be friendly, healthy and hardy. 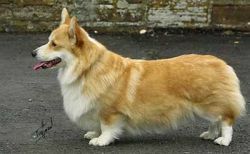 The Pembroke Welsh Corgi is believed by some to have been brought to Wales by Flemish weavers whom Henry I persuaded to come to England in 1107. Legend has it that he is an "enchanted" dog, used by fairies and elves of Wales to pull coaches, work fairy cattle, and serve as steed to fairy warriors. This is an alert, intelligent, working farm dog. A small dog, foxlike in appearance. It is an affectionate, protective companion. It's medium length coat can be black and tan, fawn, red, or sable with or without white markings. The Corgi is born tailless or in up until recently the tail was docked. Besides being a great family companion, the Corgi excels at many activities including: conformation, obedience, herding, tracking, and agility. This is an active breed and needs lots of outdoor exercise as befits a herding dog.